This post is about “Stuff”. You know, that combination of things we actually need intermingled with a lot of things we don’t and quite possibly a few things we let define us. Before we left home we started a massive downsizing of our little, itty-bitty, cute house. In fact, we sold quite a bit of stuff including our bed, couch and my shoe collection (my wardrobe wasn’t always all quick-dry and hiking shoes). All told, we brought in a couple thousand dollars that went right into the Travel Fund. Nice! With a lot of time to plan while saving, we decided in advance to get rid of anything we didn’t love or that was in bad shape. We had combined two households six years earlier and, really, how many measuring cups do you need? Well, apparently you need a minimum of four sets because that’s how many we had left. I have mad baking skills and believe me when I tell you, we need four sets. If we’d had a fifth, though, it would definitely have been added to the purge box! Which brings me to our one and only purge-rule. We’ve had this one since the day we moved in together: Tools are off limits. If it’s a tool, it’s a sacred cow. Really, tools likely fall into the category of “things we love” and that’s why they get spared. You can only purge your own tools. Aaron puts a target on the wooden mixing spoons every chance he gets and my response is always, “just how many clamps do you really need?” So the kitchen tools, art supplies, jewelry studio and woodshop are all off limits. That’s okay because we have tons more stuff. Two years ago we were packing all this stuff. Since then, I think we’ve downsized by at least 50%! What did we do with the purge box? Easy: sold things on Craiglist, took ’em to Goodwill, gave some to unsuspecting friends and the rest hit the trash. Boom. Done. (Note: this was harder to do than it sounds, but it was SOOO worth it!) Had to laugh, though, as when we got home there was a box of unsold “sell on Craigslist” items waiting right as we walked into our storage area, aka Aaron’s studio. Ha! Happily, though, we’ve already sold $800 worth in the past two months. Some things are priceless and never to be sold. 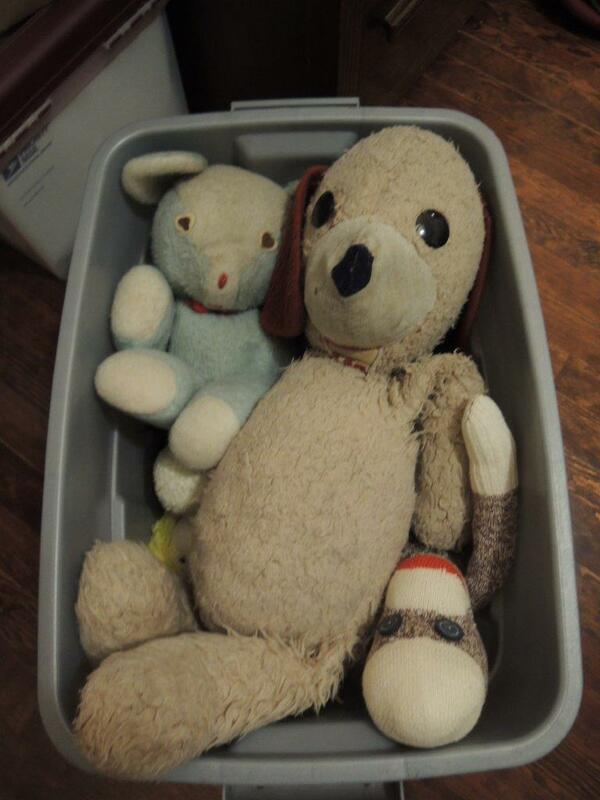 Even packing up Blue Bear, Barry and Sock Monkey was hard to do. They were almost the first to be unpacked when we got home. I mean, somebody’s gotta watch over all our hard work! 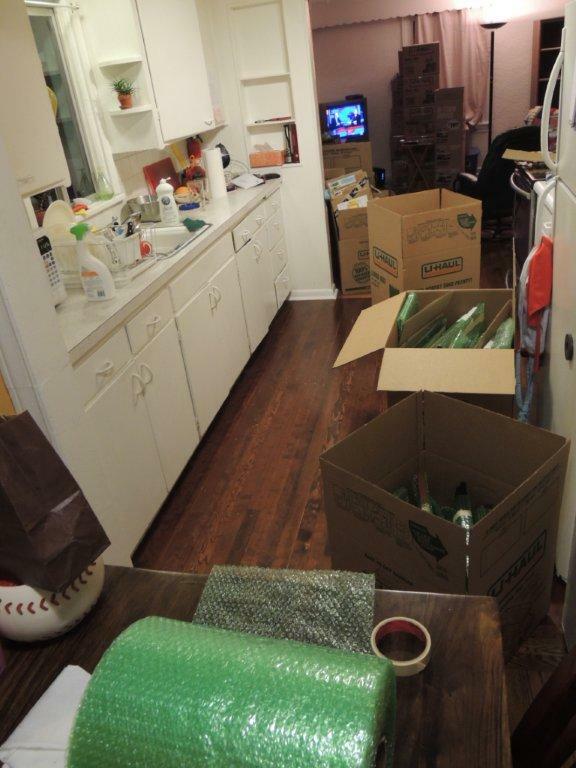 Even while we were packing, we understood that the trip would change us and, as we expected, there have been countless times while unpacking when we pulled something out of a box and immediately tossed it into the new purge box. It’s interesting how things we used to really covet, like our incredibly beautiful and pricy dining set —yes, solid rosewood from Indonesia…yes, we spent hours belaboring the decision to buy it…yes, we cringed with every scratch it got— is no longer very important to us. We’ve both wondered, “How much you think we can get for it?” I’m sort of curious how long this feeling will last. Well…time will. If you happen to want advice on cleaning out your own stuff, our friends from Spain, Betsy and Warren Talbot, are experts. No. For real, experts. I love shopping – where do you think that shoe collection I purged came from? On the trip we tried very hard to be frugal with the treasures we purchased. Left to our own devices we have a lot of trouble passing up art, especially when it’s hand-crafted. Central and South America about killed me! They came right at the beginning of our trip when we had just sold so much stuff, but even then there were things we couldn’t pass up. Any time Aaron worked with an artist, we purchased something and, conveniently (since I love it!!! ), jewelry was often times very affordable and easy to carry. Still, with just our little backpacks, something had to give. 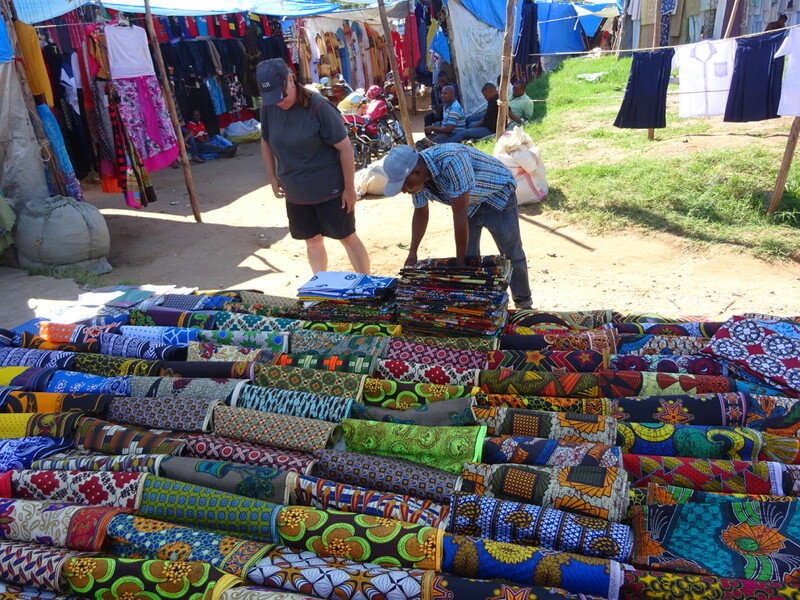 Picking out fabrics in Tanzania. This was a market in Tanga. Love me a shopping day! What did all that mean? Basically, we shipped stuff home. We might send it through the local mail. Other times we would ship it back to the States with friends who visited or folks we met while traveling. 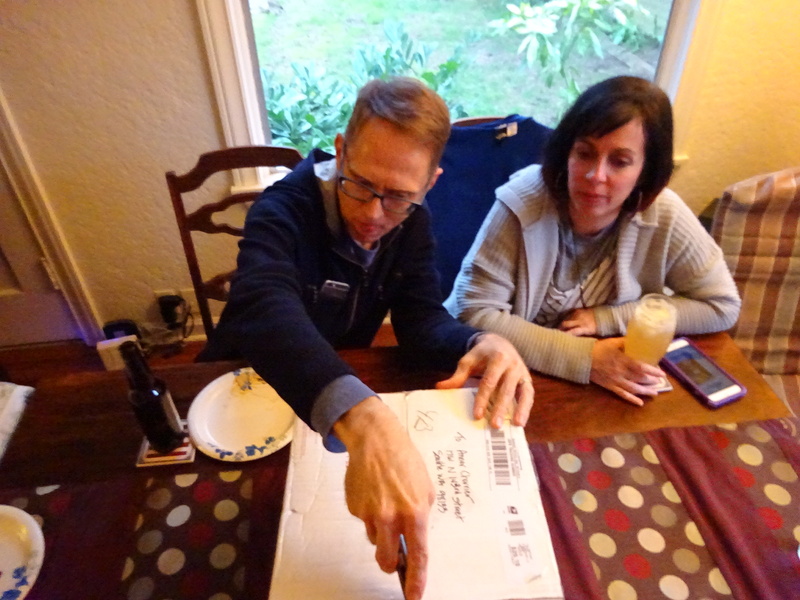 We gave them postal money and instructions to ship it to Aaron’s mom, the Keeper of our Stuff. Really a very easy solution. We took a photo of most things before it left our hands so that if it got lost we could at least remember it later. Turns out, nothing got lost! 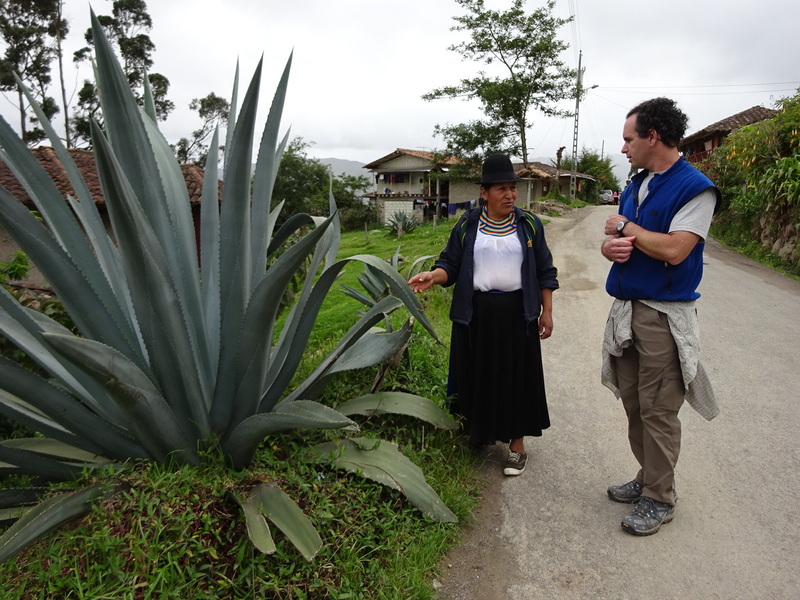 We were happily surprised by how friendly and efficient the postal services were around the world. 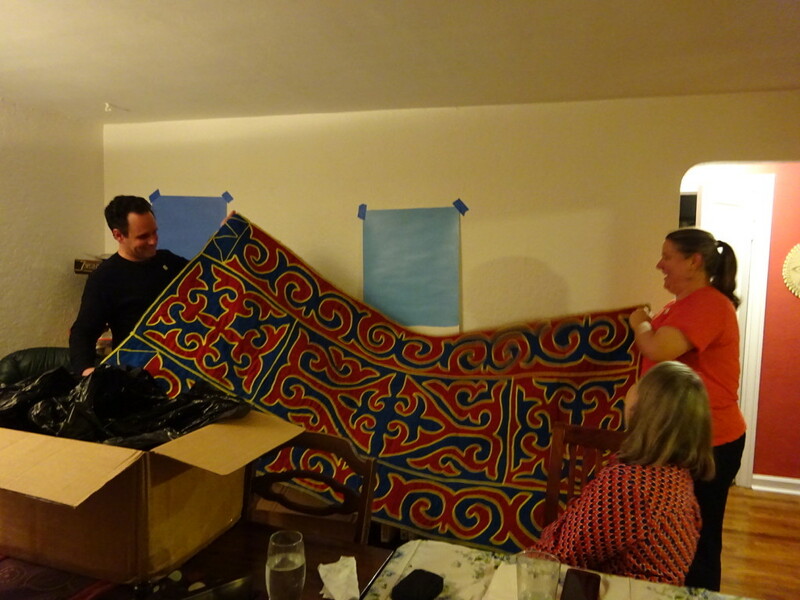 Our fabrics from Tanzania arrived in Florida in less than a week! Crazy! The Cardiff post office in Wales actually told us exactly how to divide our stuff up so we could get the lowest price AND THEN scrounged up free packing materials for us! 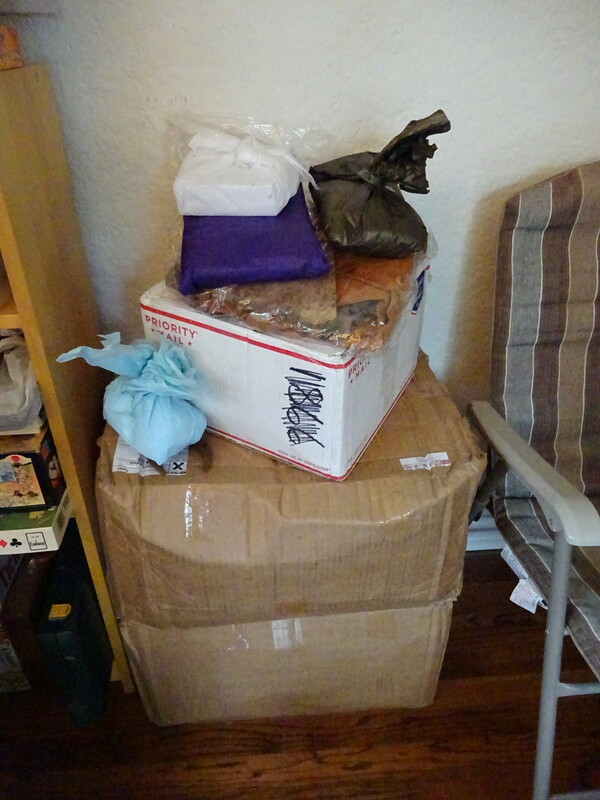 We shipped things from four continents and it all arrived with no problems at all. In fact, we also mailed about 10-15 postcards from every country we visited and every one made it. Postal services are pretty darn amazing! As were our friends who were kind enough to carry stuff back for us and Aaron’s mom for collecting it all and then shipping it to us in Seattle. So that’s how we were able to bring home a little collection of treasures to remind us of the trip. Once home we held a Box Opening Party. At first that seemed like a weird, self-absorbed thing to do (as if this blog isn’t just a bit narcissistic), but we did it anyway; fitting in as many friends as our house would allow, including a few out of state visitors (how great is that!). One by one, the boxes arrived and were saved for the party. Kinda like before Chrismanukah, but a much bigger pile. Once properly opened we dug in to find all the treasures we remembered…and all those we’d forgotten!! Here’s a 90 second video to give you an idea of what it was like opening all our long-ago-shipped treasures. Did you watch? The whole Box Opening Party was really THAT MUCH FUN! Necklace from Ecuador and my friend Cynthia. I thought it was totally her color. 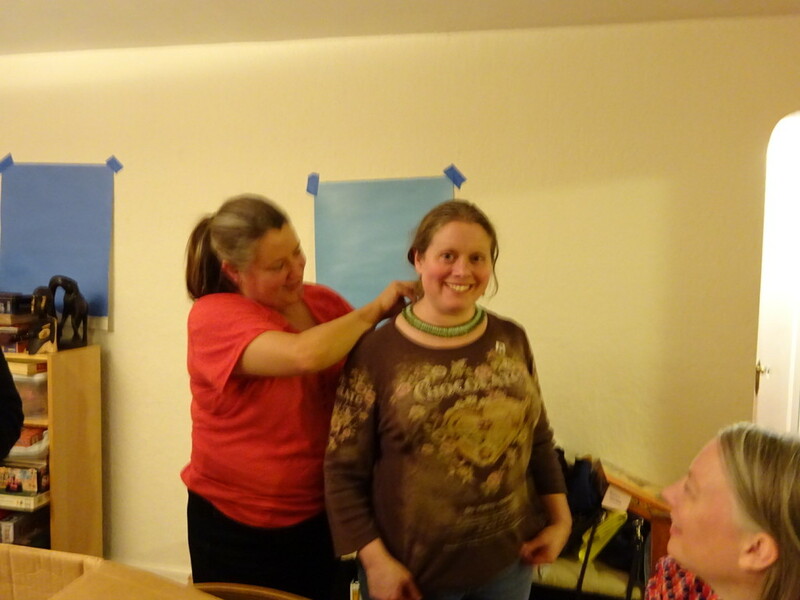 We purchased the necklace and some earrings from Maria, our homestay-mom from Namarin, Ecuador. Now this I did NOT expect. 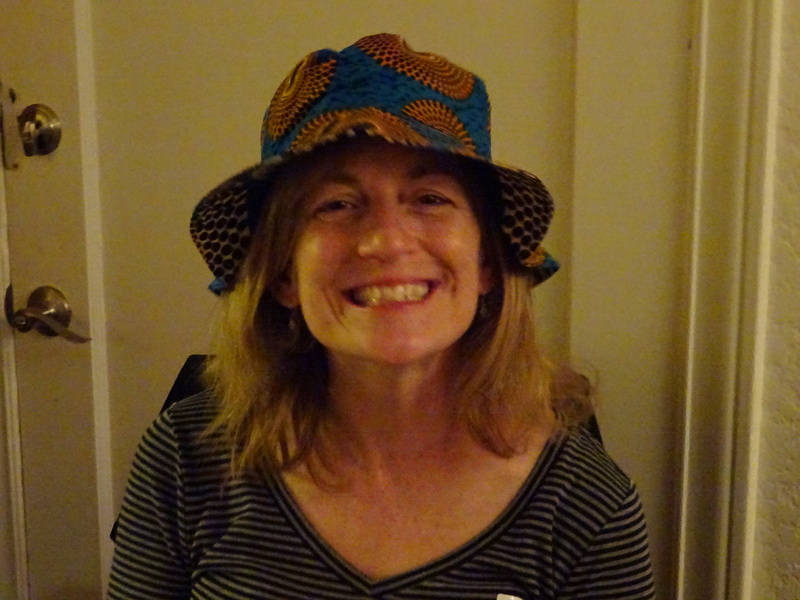 Brigit (who also met up with us in Spain) was made for this hat! Not sure I’m ready to give it up though…perhaps we can convince her to do an African trip with us to get her own? We got the cool hat in the same market stall as I got this skirt. I remember the women being so incredibly nice and wanting badly to find something we would buy. Success! The Rug! And who says you can’t transport scent? You sure as heck can in your Mongolian rug. Seconds after this photo was snapped everyone came closer to get a whiff of good ole yak! 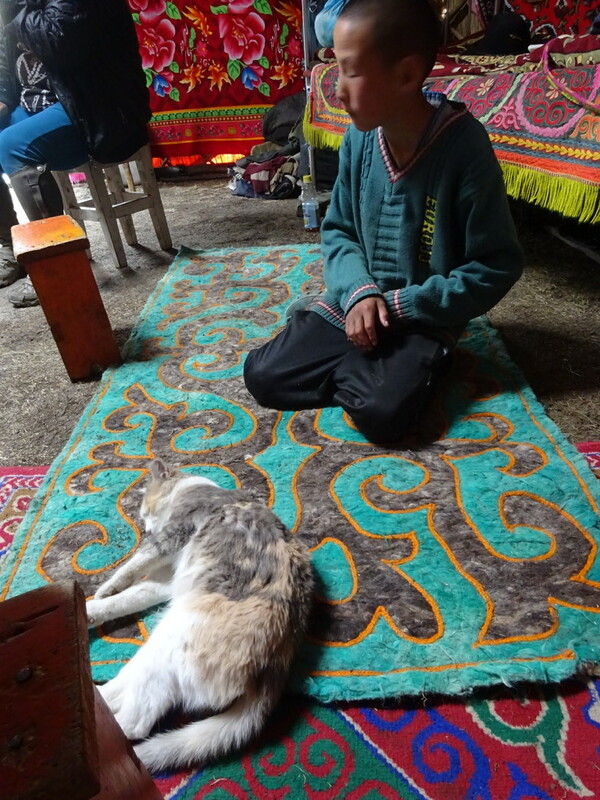 Do you remember when we got our Mongolian / Khazak rug?? The woman on the right made it and soon it’ll be the focal point of our living room. Once it airs out enough, anyway. Almost like it was a focal point in the ger. The next day I couldn’t even fit everything into one panorama (there’s more stuff behind me). Double click on the photo to get an up-close view. This is a five minute narrated video showing all our awesome stuff! If you missed the party and want to see it all, here you go! Lastly, Just Carry-ons? No Way! Trust me, we’ve been grilled on this one. Actually, yes, we travelled the world for those 15 months with just carry-on’s. 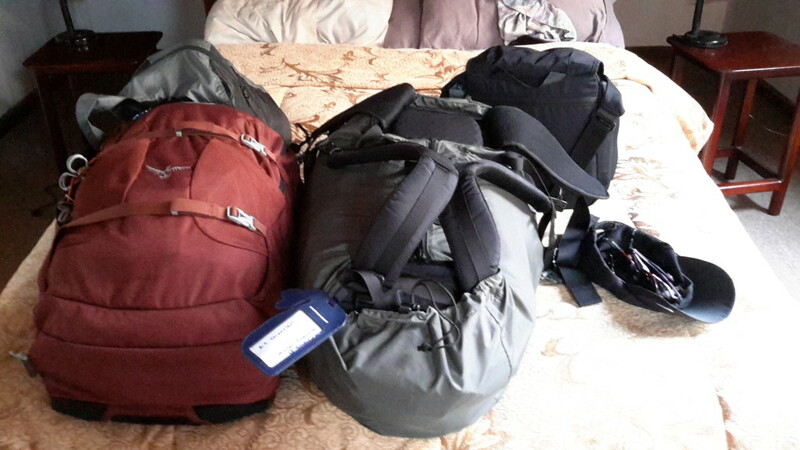 Most of the time we also had a small extra bag with us for all our electronics, passports, money, etc, but on some trips they didn’t allow us to carry-on the third bag. In that case we’d empty the bag, fold it up (everything has to be packable on a trip, even the packs!) and fit everything into our pockets to board the plane. We’d then pull out the third bag once we reached our seats, empty our pockets and it was back to business as usual! All together the two of us brought 45 pounds of stuff with us on the trip. Yes, about 10 kilos / 22 pounds each. We had no problems with weight overages at airports…though we juuust squeaked by sometimes. Our luggage always fit in the overhead compartment, which meant it rarely traveled out of our sight — which is kind of what we wanted. It made travel less worrisome and a lot easier. A LOT! We always managed to stress about “will they let us take it on…what if we have to check…don’t forget your medicine this time!“, but it was never a problem. Not once. Well, as long as you don’t count the time when Aaron’s suitcase went missing in Mongolia. Pack ‘er up!! Heading out to catch our transport for the day. On our very last flight, the one back to the U.S., I was shoving my pack into the overhead where it was gonna fit, no problem, but the guy across the aisle from me said some passive aggressive thing under his breath about “over-packed did we?“. I quietly smiled at the man while thinking to myself, “Sir, you have no idea just how lightly I have packed.” With that, I sat down and headed to Boston. And that, my friends, is the story of our Stuff. « More Colors in Barcelona Street Art! I love this post. And I died laughing at the video clip from the party. That night was SO much fun. So happy you could provide the soundtrack to the box opening. Awwwwwesome! How in the world you kept from buying such a small amount of fabric in Tanga is definitely a tribute to your self-control. I would have had to hire a whole airplane to get my choices home. It was such fun visiting and seeing all your treasures. My favorite is still the tiny sculpture made out of watch parts. Such wonderful treasures with so many fine memories attached. 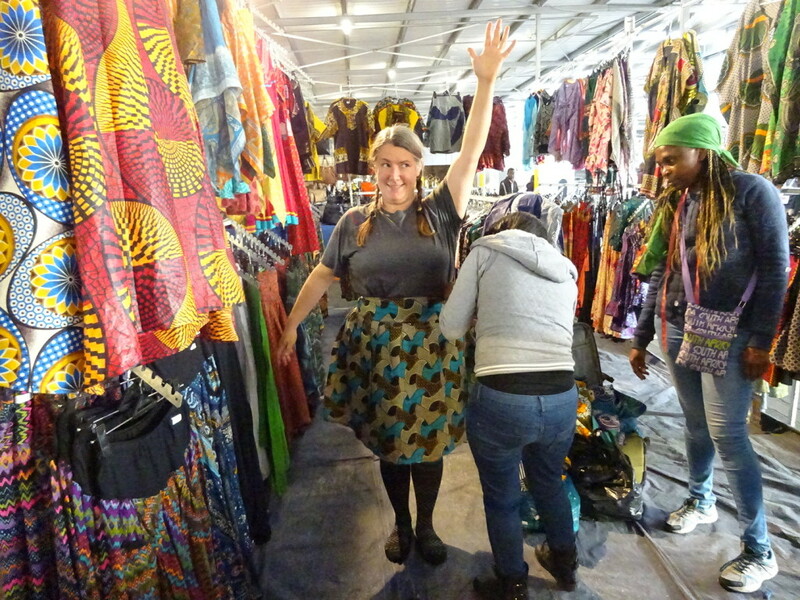 Next time we go to Tanzania I’m bringing a seperate suitcase just for the amazing fabrics. I’m not even joking. Great stuff about stuff. I am stuffed with laughter!